Marsh was a quite versatile writer: his books range from supernatural horror, to murder mystery, to comedy, to adventure, to the genuinely unclassifiable. 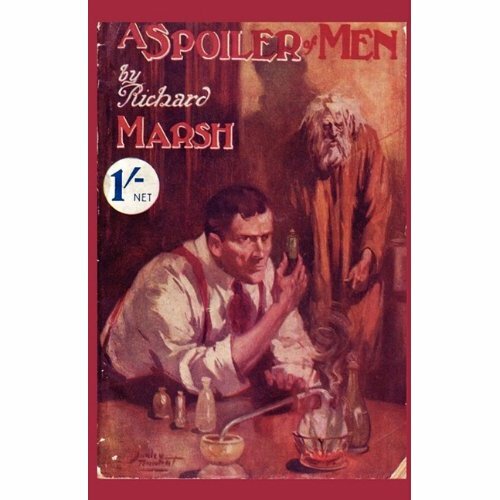 Marsh continues the trend in A Spoiler of Men, where the primary character is in fact an anti-hero, and the story is a bizarre thriller involving, among other things, chemical zombification! This is one of those books where it is difficult to explain the plot without giving away too much of the story. The main and titular character is Cyril Wentworth, a very successful London socialite with political aspirations and a planned engagement to a famous novelist. He is also a man with a very dark past, and a present filled with a number of sinister schemes. His plotting is interrupted when he comes home one night and finds a mysterious young woman ransacking his apartment. She taunts Wentworth with the knowledge that she is aware of his past deeds, but refuses to reveal anything about herself other than her hostility towards him. He attempts to detain her, there’s a scuffle, and she manages to escape. Wentworth attempts to advance his plans nevertheless, but events spiral rapidly out of control and, eventually, his dark secrets are revealed. The most groundbreaking aspect of the novel is what is likely the first fictional description of “chemical zombification”; as noted in the introduction to the Valancourt edition, England had just been exposed to the practices of voodoo five years earlier in a nonfiction book about Haiti by Hesketh Pritchard. (Curiously, Pritchard and his mother also wrote ghost stories under the pseudonyms E. and H. Heron; he not only inspired weird fiction, he wrote it!) Though not a voodoo practitioner, the character Wentworth is a chemist who has mastered the ability to zombify, and he uses it to further his evil ends. Beyond being the first fictional introduction of “zombies”, I also wonder if ‘Spoiler is one of the first stories to explore the use of science to control people’s minds. The other rather groundbreaking aspect of ‘Spoiler is its introduction of a strong female character — and in a good way, not an ‘uppity’ way. The mystery woman, whose exact role in the novel I will not spoil, is portrayed as extremely strong willed, intelligent, and moral — not to mention attractive! I had noted after reading Marsh’s The Magnetic Girl (1903) that he seemed to have a rather enlightened attitude towards women, as least according to my naive understanding of late Victorian/early Edwardian society. For instance, women couldn’t even vote in the U.K. until 1928. ‘Spoiler is consistent with my earlier impression. One thing that is rather unenlightened, however, is Marsh’s treatment of academics! We are introduced to two professors in the novel, neither of which is portrayed in a very flattering light. One is a scholar of ancient Greece who is portrayed as being naive, utterly unworldly and completely socially inept. The other is a genius professor of chemistry who is portrayed as arrogant, misogynistic — and completely socially inept! Considering these sort of stereotypes are still going strong a hundred years later, however, I’m willing to forgive Marsh for using them. A Spoiler of Men is another wonderfully compelling novel by Richard Marsh and, I would say, a somewhat more mature one. Although he introduces a number of stereotypical characters, he also introduces a delightfully nasty villain as the central character, and a remarkably strong female character. Like pretty much all Richard Marsh I’ve read, I recommend it! I helped record The Beetle for Librivox.org and enjoyed it very much. I will have to check this story out, too! This is one of those books where it is difficult to explain the plot without giving away too much of the story. Which is why you need to provide a . . . spoiler alert! !